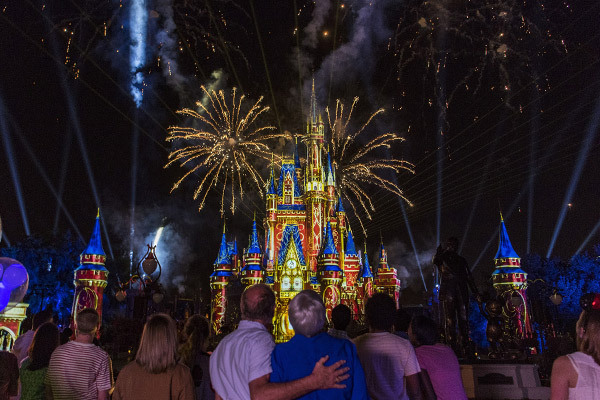 The highly anticipated nighttime fireworks and projection show Happily Ever After made its bombastic debut at Disney’s Magic Kingdom on Friday, May 12, 2017. Walt Disney World guests can now experience the grandest of finales with this awe-inspiring spectacle that combines the magic of Disney storytelling, high-flying fireworks, state-of-the-art projection mapping technology and everyone’s favorite Disney characters. Replacing the long-running Wishes fireworks show, Happily Ever After delivers the most spectacular fireworks show to date. So gather ‘round Cinderella Castle and prepare to sing along to a moving and thrilling playlist, featuring the show’s own theme song, titled “Happily Ever After,” sung by Angie Keilhauer and Jordan Fisher, as well as contemporary versions of Disney’s beloved songs, including moments from The Princess & The Frog, Moana, The Little Mermaid, Aladdin, Brave and many others.